Ceviche is a raw fish salad, the fish being cured in lime juice. It's quick and easy to make, and absolutely delicious. Most countries in Central and South America have their own versions of ceviche, but this is the classic ceviche from Peru. You can use any firm-fleshed white sea fish for this (cod, hake, pollock, coley, hammour, tilapia etc). But just a word of warning - the fish should have been deep-frozen for at least 24 hours before you use it, to kill the parasitic worm Anisakis which can make you very ill. I would avoid fresh fish and also freshwater fish for this recipe. Make sure the fish is completely free of bones, and peel off any skin. Slice the fish into strips about 6mm (quarter of an inch) wide. Peel and finely slice the onion - a mandolin is perfect for this. Chop the chilli into fine slices, and finely chop the coriander. Mix them all together in a flat dish with the fish. Squeeze the lime juice and orange juice over the dish, and stir to make sure everything is coated. After about 20 minutes, the fish will be opaque on the outside, slightly less so inside. This is a bit too close to raw for me, so I let mine 'cook' for 30 minutes. Eat the ceviche as soon as you can after this, as it will continue to 'cook' in the lime juice and will be quite unpleasant after an hour or more. Serve with quacamole and sweetcorn. The video above is from the Keef Cooks YouTube channel. 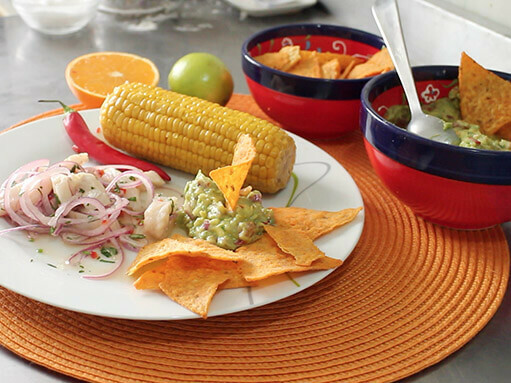 Click here to see the video recipe of Ceviche on YouTube.